Tumors, also known as a neoplasm, develop when cells divide uncontrollably, forming a lump or mass of abnormal tissue. It is a growth of cells that serves no purpose. Tumors can affect any part in the body and develop in any part of the body. Tumors are divided into two categories: benign and cancerous. There are different types of tumors that can develop and affect the bone. However, these are most easily broken down into two categories: benign and malignant tumors. Most bone tumors are not cancerous (benign). Benign tumors are usually not life-threatening and, in most cases, will not spread to other parts of the body. Treatment options are wide-ranging—from simple observation to surgery to remove the tumor. Glomus Tumors are growths that are most often found in the nail bed under the fingernails, although they can also exist in finger pads as well as on the palm, wrist, and forearm. They normally appear as small dark red or blue lesions underneath fingernails and can cause cold-sensitivity, tenderness and, occasionally, burning pain. Although benign, Glomus Tumors are generally surgically removed. 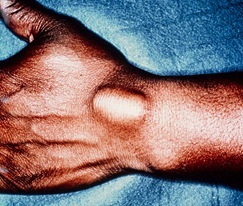 Ganglion Cysts are fluid- or gelatin-filled bumps that most often appear on a damaged ligament or tendon of the wrist, although they can appear almost anywhere on the fingers, hands, and wrists. They may occur in people who use their wrists in strenuous physical activities like gymnastics, tennis, golf or guitar- or bass-playing. Some ganglion cysts will go away or vary in size over time, causing nothing more than an unsightly lump. Troubling and painful cases may be treated with splinting, aspiration, cortisone injections, and arthroscopic or mini-open surgery. Sometimes ganglion cysts are a sign of a more significant, underlying ligament or tendon injury, which requires attention. Digital Mucous Cysts are synovial cysts that appear either on the top knuckle near the fingernail or adjacent to the cuticle. Usually caused by a near-lying arthritic joint and occurring most often on the middle or index finger of the dominant hand, these cysts are benign and vary in size over time. Persistent cysts that are painful, stretch the overlying skin excessively or cause nail deformities that suggest the need for surgical removal and joint debridement. Enchondroma is a type of tumor (usually benign) that frequently grows in the small bones of the hand. Most often found in young people, enchondromas are painless and normally demand no treatment other than monitoring over time. Occasionally the tumor-weakened bone may fracture. Splinting and surgical removal of the lesion may be necessary. Enlargement or pain warrants a physician’s evaluation. Osteochondroma is usually a non-cancerous bone tumor that begins before growth stops in adulthood. Most commonly identified by a painless bump located at the ends of the long bones of the arm, this kind of tumor is not removed surgically unless it causes pain, stiffness, tingling or rubbing of a nearby tendon. Enlargement or pain warrants a physician’s evaluation. Patients may or may not experience pain in the tumor or the tissue surrounding it. Pain may be described as dull and aching, may worsen at night, and may sometimes increase with activity. Benign tumors may be discovered incidentally, such as when an x-ray is taken for another reason. The cause of a benign tumor is unknown. They develop when cells in the body divide and grow at an excessive rate. Tumors often occur when parts of the body grow rapidly. Patients with bone fractures repaired with metal implants are more likely to develop osteosarcoma (a malignant tumor of bone) later. Following the identification of suspicious bone lesion, a simple set of investigations are required to form a diagnosis and a treatment plan. If your tumor is benign, your doctor may recommend monitoring it closely to see if it changes. During this time, you may need periodic follow-up x-rays or other tests. Some benign tumors can be treated effectively with medication. If you have bone cancer, treatment will include a team of doctors from different medical specialties working together to provide care. Your team may include an orthopedic oncologist, medical oncologist, radiation oncologist, radiologist, or a pathologist. Treatment depends upon several factors, including the stage of cancer. If the cancer is localized, cancer cells are contained to the tumor and the immediate surrounding area. When cancer has reached a metastatic stage, it has spread elsewhere in the body and may be more serious and harder to cure. Generally, malignant tumors are removed by surgery. In some cases, your doctor may recommend excising the tumor or another surgical technique. This surgery removes the cancerous section of bone but keeps nearby muscles, tendons, nerves, and blood vessels intact where possible. The surgeon will take out the tumor and a portion of healthy tissue around it. Recovery is determined by size and complexity of the type of tumor and procedure required to remove it. Your doctor may order more x-rays and other imaging studies to confirm that the condition has been resolved. Even though the tumor has disappeared, it is important to monitor your body for signs of recurrence. Please contact us as soon as possible to schedule an appointment with our talented team. People who notice new growths should be evaluated to try and reduce the risk of further injury and mobility issues. If you have been injured, it’s important to be evaluated by a highly skilled professional. Call Dr. Mark Pruzansky and Dr. Jason Pruzansky at 212-249-8700 to schedule an appointment and obtain an accurate diagnosis.